Sometimes you want a bit of chocolate cake and don’t want to take the time or the calories to make a full 9″ double- or triple-layer cake. I tend to be very prone to having fits of chocolate cravings so the other evening, I decided I really needed a chocolate fix. Nor did I feel like waiting the three hours for a cake at 10pm at night. I didn’t even want to wait the 45 minutes it would take for me to whip up a batch of Double Chocolate Muffins. As I’ve alluded here in the past, I’m not eager to bake a whole cake for one craving when I’m trying to reset my eating and lose some weight. I wind up eating at least half the thing over the following couple of days (wouldn’t want it to get stale!) and feeling guilty. I didn’t feel like having a generous helping of guilt along with my cake. 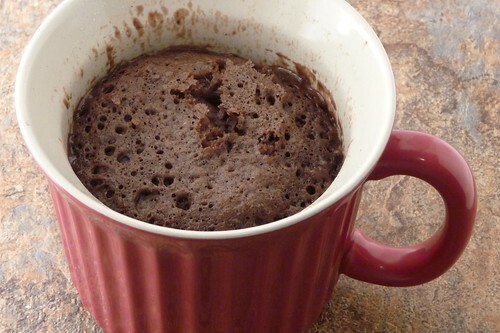 I remembered seeing someone on my RSS feeds link to this mug cake recipe. I’ve tried those mug cakes before and honestly, it didn’t really work out. (Don’t trust those 5-ingredient recipe thingies for mug cakes. They just don’t taste like cake.) This one, on the other hand, looked like it was right about what I had in mind. Unfortunately, the original two-mug recipe isn’t the most “light” creation, clocking in around 500 calories in each mug once a bit of ice cream is added in, but it’s less than the average slice of cake and far less than the average half a cake. However, I found that the first time I made it, it was really too much at once for me, so I like to subdivide the recipe into four mugs, saving a couple for later. (I found this is easiest to do if you mix the batter up in a bowl and pour equal portions into each mug.) I also plan to rework it a little to see if I can reduce the calories. It turned out really well. (You’re not surprised, I can tell. I don’t post recipes I don’t like as I would feel bad leading you down some rotten path and this blog is my personal cookbook.) It came out moist, not too dense thanks to the cake flour and baking powder, chocolate-y and just right with a bit of ice cream. It was definitely just right to satisfy my cravings for a while. Also, a tall glass of milk is really, really good with this, as is a bit of fresh strawberry sauce. This recipe makes two big mugs’ worth or four normal mugs’ worth of chocolate cake, so you need to split the ingredients equally between the mugs. The hardest part is splitting the egg; here are a few methods for measuring besides pouring and hoping. Use your kitchen scale and weigh the beaten egg, then replace it with the mug on the scale and pour in half by weight. Or, mix all of the ingredients together in a bowl and then pour equal amounts into each mug. This is the method I find the easiest, even if it dirties up an extra bowl. Alternatively, you may find it easier to use a product such as Eggbeaters which allows for measuring out a portion of an egg. Whisk together half of the dry ingredients, excepting the chocolate chips, in each mug. Add the wet ingredients and whisk well to combine. Sprinkle chips lightly over the top of the batter and cover the mugs with plastic wrap. Microwave each mug separately on 50% power. I followed Not Quite Nigella’s recommendation and used my microwave’s “Melt Chocolate” function3, which took about 90 seconds for a large mug and 60 seconds for a small mug. Check after 60 seconds – the cake should puff up nicely. When it looks like a nice, moist cake, stop. It will cook a bit further due to carryover. Serve with ice cream4 and milk. If you don’t have vanilla sugar, add 1/2 tsp vanilla extract. I first tried this with big 16 oz “mugs” that I use for French Onion Soup. Latte mugs (those big, wide mugs you get cafe au lait in at posh coffeebars) would be very nice here as well. If you use standard 10 oz coffee mugs, be careful when splitting between two as it will quite likely boil over. My microwave is 1100W. If you don’t have a Melt function (most microwaves don’t), then set the Power Level to 50%. For extra decadence, top with hot fudge or chocolate syrup. This entry was posted in american, cakes, one-dish, snack, untranslated. Bookmark the permalink.